Elaborate and elegant piteado and silver saddle and accessories, owned by the former President of Mexico. On an El Tigre rawhide tree, with high-relief silver work and extensive piteado embroidery of the finest craftsmanship. 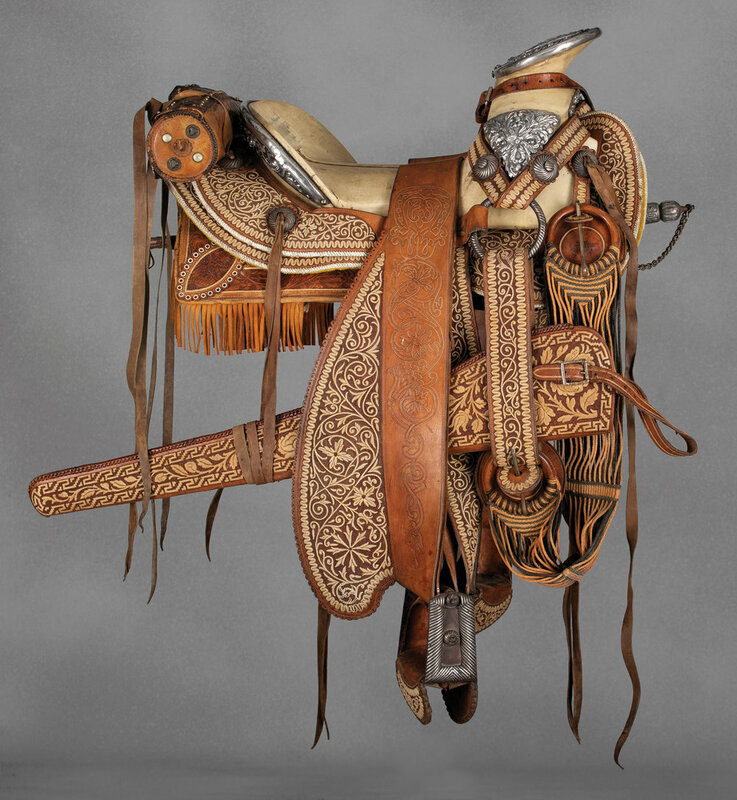 Leather laced edges, silver conchos and stirrup mountings. Impressive horsehead and horseshoe “crest” in silver on the horn. Matching saddle bags, rifle scabbard, and matching sword scabbard on the other side that is complete with an engraved sword with silver handle and guard. The acid etched blade reads, “Solo que la mar se seque no me bañaré en sus olas” with “Oaxaca” on the other side. Matching bridle with silver horsehead and horseshoe decorations. Complete with ornate fringed saddle pad with floral tooling and lion’s head designs in corner, and a rare and unusual dispatch case. Includes wrought-iron stand. Manuel Ávila Camacho was president of Mexico from 1940 to 1946. Lot 491, Brian Lebel's Old West Auction - January 25-26, 2019. Mesa, AZ.